When Optimal Performance Consultants refers to WELLBEING we are actually taking a page from the in-depth research by Steelcase & Optimal Performance Consultants. Corporate Wellbeing is a term you will be hearing more about thanks in large measure to the research conducted by Steelcase which Optimal Performance Consultants embraces as an approach to our Ergonomic – Strategic consulting – Accessible & Human Centred Design practice. When Corporate Wellbeing is in place at a bona fide organizational and strategic level there results, enhanced employee health outcomes, lower levels of absenteeism; fewer medical & insurance claims; enhanced human performance or as we like to say optimization of human performance. There also occurs demonstrable substantial cost savings. For example, Steelcase’s health insurance premiums in 2013 increased 3%, which was less than half the 7.5% increase estimated for the year by PricewaterhouseCoopers for Steelcase. It is critical for WELLBEING’s goals to be about more than just cost reduction. “Most companies are interested in wellbeing, but mostly as the potential for lower insurance premiums. Beyond that, they think its fluff. As a finance guy, I can tell you that our wellbeing strategy has paid off in terms of organizational performance,” Dave Sylvester, CFO Steelcase USA. Organizations must undertake a global approach to workplace design for example by obtaining certification using the soon to be released BOMABest Accessible Design Audit & Awards or the LEED V4 approach. Organizations must ensure the purchase and maintenance of products, workspaces & environments must meet pricing strategies while also guaranteeing improved wellbeing of employees. Organizations develop strategic and operationalized ergonomic, OH&S, Environment, FM, and accessible or universal design processes which are used at every stage from procurement & design to installation, build/renovate/move. Many a company and consulting firm uses words such as health, wellness, ergonomics, positive culture etc. in their day to day business and even in the policy statements. Organizations who truly “get” the importance of their employees as drivers of success will adopt the more strategic approach. “Wellbeing” as practiced by OPC Inc. with our Canadian and US based clients involves many aspects of organizational culture, from making sure people understand what their job is all about & how it contributes to a company’s success all the way to providing the right workspace, tools and resources to be successful on a consistent basis. Research shows that successful organizations support their employees with this more all-encompassing approach to enhance mental, physical and cognitive wellbeing. The solution in the workplace and the best way to achieve employee and corporate WELLBEING is to be very strategic at the start of all facility related projects which may be updates to furniture; design of a new floor; moving to a new workspace. Being strategic means IT, FM, HR, CFO’s, OH&S, Ergonomics/Human Factors specialists all work together with the Architects, Interior Designers, Maintenance, Purchasing to bring about job design and workplace design which allows employees to have more choice about where they will work (workstations, quiet meeting rooms, break rooms etc. ); how they will work in terms of being able to change their mental and physical states; collaborative or private work. The provision of simple-to -follow dynamic movement programs such as ensuring stairwells are conducive to stair use; lunch rooms have standing counters; well lit & safe pathways encourage people to walk during lunch breaks; the provision of on-going training and support for the use of standing and stretching during the day; changing the culture to emphasize health and fitness, ensures employees are physically energized, mentally stimulated which helps people stay refreshed and engaged. This is WELLBEING at its best. Workplaces which are putting this into place or are starting this process need to use a strategic not program based approach. This guarantees success & long term outcomes including WELLBEING of the employees and the organization. We customize seminars to include topics of your choosing and information related to your specific type of business. 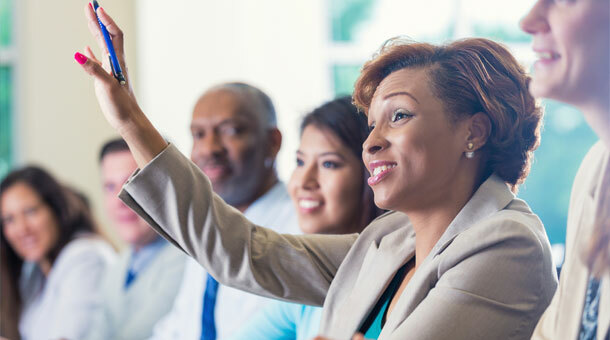 Our team also incorporates your company’s brand, values and goals into our seminar presentations to connect with your employees. Learn more about OPC’s educational services. Each of these processes has been extensively studied and proven to improve health outcomes, prevent disability and improve the financial bottom lines for organizations which have instituted them. Psychological illnesses are present, and have been present in various forms and manifestations in the workplace for as long as there have been workplaces. It is only recently that employers are starting to understand the size of the challenge and the potential costs, both human and financial. 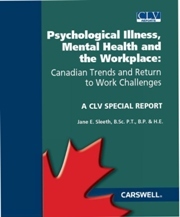 This book is intended to specifically address psychological illnesses and disabilities so that the employer, the manager or the union representative is able to understand the size and scope of the problem and be able to differentiate performance issues from bona fide psychological impairments. Most importantly this book is intended to help the HR professional, manager or supervisor to ensure that Disability Management Programs and Return to Work processes are integrated such that these illnesses are taken into account. A hands-on, easy-to-use resource that offers tremendous time-saving opportunities for managers seeking to initiate or update their own return to work programs. Learn how to comply with all legal and regulatory requirements, and see examples and best practices from across Canada. Jane Sleeth, B.Sc. P.T., B.P. & H.E., is the Managing Director and Senior Disability Management Consultant for Optimal Performance Consultants Inc., a national total absences management firm. 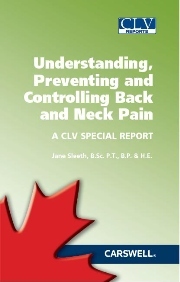 She has worked in the field of rehabilitation, disability management and preventative ergonomics for more than 25 years.